2018년 10월 22일부터, 르 꼬르동 블루 파리캠퍼스 학사과정(Bachelor of Business in Culinary Arts Management and Bachelor of Business International Hospitality Management) 3학년 학생들은 파리-도핀대학교(Paris-Dauphine University)에서 주 3회 수업을 받게 됩니다. 컬리너리 아트 및 호스피탈리티 매니지먼트 분야의 세계적인 교육기관 르 꼬르동 블루 파리캠퍼스와 조직 및 의사결정학 분야의 기준이라 할 수 있는 파리-도핀 대학교가 파트너십을 체결했습니다. 르 꼬르동 블루 파리 학사과정을 위한 이 첫번째 파트너십은 미식 및 호스피탈리티 업계 매니저를 꿈꾸는 프랑스 및 전세계 유능한 학생들을 위한 것입니다. Bachelor of Business in International Hospitality Management. 2018년 10월 22일부터, 해당 학사과정을 듣는 3학년 학생들은 월요일부터 수요일까지 파리-도핀대학교 캠퍼스에서 수업을 받게 됩니다. 학사 3학년 과정은 학생들이 업계에서 성공하기 위한 핵심 요소들을 갖출 수 있도록, 특히 미식 및 호스피탈리티 분야의 전문성 및 비즈니스 매니지먼트 스킬을 배우는데 초점을 맞추고 있습니다. 주요 과목으로는 마케팅, 매니지먼트, 인사 관리, 고객 관리, 소셜 네트워크, 재무 및 회계 등이 있습니다. 특히 국제적인 커리어를 염두하고 기획된 이 학사과정의 전문 과목들은 영어 및 불어(영어 통역)로 수업을 합니다. 3년 학사과정을 성공적으로 마친 학생들은 Paris-Dauphine University의 international “Talent in Culinary Arts and Hospitality Management” diploma 및 Le Cordon Bleu의 “Bachelor of Business in Culinary Arts Management” or “Bachelor of Business in International Hospitality Management” diploma를 받게 됩니다. 파리캠퍼스 학사 수업은 연 1회 개강하며 최대 두 클래스를 운영하고 한 클래스 당 25명의 학생으로 구성됩니다. 1,2학년은 대부분 르 꼬르동 블루에서 수업을 받게 됩니다. 르 꼬르동 블루에서 개발한 교육과정들은 학생들에게 최상의 교육을 제공할 수 있도록, 그들의 전문적인 목표에 맞춰 계속 업데이트 되고 있습니다. 저희 학사 과정 역시 전세계 각지에서 특별한 파트너십을 맺은 분들과 협력하여 맞춰나가고 있습니다. 오늘 이 자리에서, 명성 있는 파리-도핀 대학교와의 파트너십을 공표하게 되어 매우 뿌듯합니다. 전세계 20개국에 캠퍼스가 위치한 명성 있는 르 꼬르동 블루와 맺은 이 파트너십은 저희 대학이 퀄리티 있는 파트너십을 통해 국제적으로 나아가기 위한 장기적인 전략을 완벽하게 따른 것입니다. 저희는 2018년 10월부터 저희 대학에서 “Talent in Culinary Arts and Hospitality Management” 수업을 받게 될 학생 여러분을 환영합니다. 파리 도핀대학교는 재무 및 마케팅부터 프로젝트 매니지먼트 및 고객 관리까지 대외적으로 인정받은 저희의 전문 분야에 포커스를 맞춰 학생들이 사업적인 노하우를 개발할 수 있도록 할 것입니다. 르 꼬르동 블루 학사과정 학생들은 이번 파트너십을 추진한 파리 도핀대학 디플로마 매니저 Renaud Dorandeu & Ollivia de la Vallière의 지도 아래 수업을 받게 될 예정입니다." Paris-Dauphine is a higher education establishment which is a benchmark in the field of Organisation and Decision sciences. its social commitment and its innovative and creative flair. The only French university which is EQUIS accredited, Paris-Dauphine is spreading its influence around the globe and is ranked in the top 40 universities in the world for mathematics. With its international campuses (Casablanca, Tunis, London, Madrid and Mannheim), Paris-Dauphine has also developed strategic international partnerships such as the Sigma partnership (Copenhagen Business School - Denmark, Fundaçao Getulio Vargas - Brazil, Singapore Management University - Singapore, St. Gallen University - Switzerland, Esade Barcelona - Spain, Wien Wirtschaft Universität - Austria, Hitotsubashi University - Japan, Renmin University - China). The development of its academic partnerships stretches over the 5 continents and focuses on off-site training programmes or double diplomas. 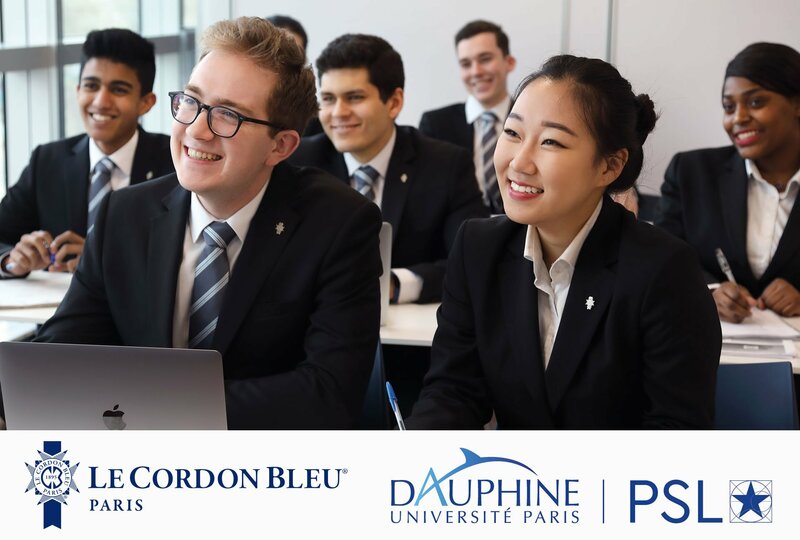 A founding member of PSL University, Paris-Dauphine has joined forces with 22 establishments and prestigious Parisian research bodies covering a vast array of disciplines (Ecole Normale Supérieure, Mines ParisTech, écoles d'arts, Ecole des Hautes Etudes en Sciences Sociales…). To date, PSL University counts 26 Nobel Prize winners, 10 Fields medals and 34 gold medals from the CNRS. Ranked 72nd in the world by Times Higher Education in 2018 and number 1 in France, this new ranking means that France now boasts one of the top 75 universities in the world.